Quick overview Unlock is a four-level academic skills course that combines thought-provoking video from Discovery Education(TM) with carefully scaffolded exercises and a fresh approach to critical thinking skills. 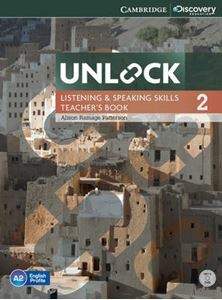 Unlock is a four-level academic skills course that combines thought-provoking video from Discovery Education(TM) with carefully scaffolded exercises and a fresh approach to critical thinking skills. The Listening and Speaking Skills 2 Teacher's Book with DVD provides detailed lesson plans for classrooms. Language Notes, Background Notes and Optional Activities are included to ensure you get the most possible from the materials and can deal with queries from students. In addition, the Teacher's Book provides ideas on how to get even more from the Objectives Review, Wordlist, and Review Test sections. The Discovery Education(TM) video on the Teacher's DVD (also accessible via our LMS) is used to introduce topics, promote discussion and motivate learners. The videos provide a new angle on a wide range of academic subjects.